Ninety miles from Florida, the island of Cuba has since long before the Castro revolution focused its attention upon, and drawn the attention of, the United States. American interest can be traced to President Jefferson; events since 1959 have kept the two nations constantly at odds. 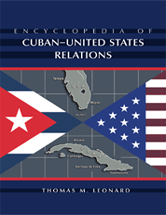 This encyclopedia places persons and events in the context of Cuban relations with the United States and vice versa. An introduction and chronology provide a background. From ADAMS, JOHN QUINCY to ZAYAS, ALFREDO, entries cover such topics as policies (e.g., Isle of Pines Treaty, 1931 International Sugar Agreement), leaders (e.g., Fulgencio Batista, John F. Kennedy) and events (e.g., Bay of Pigs invasion, Baltimore Orioles vs. Cuban All-Stars in 1999). Many see references interconnect the entries.